… and the Missonis are a good example of how a family-run business can operate successfully. Probably the best-known knitwear designers in Italy today, and among the most famous in the world, the Missonis first appeared on the fashion scene back in 1966 with a collection which was likened at the time to a “revolution” in knitwear. 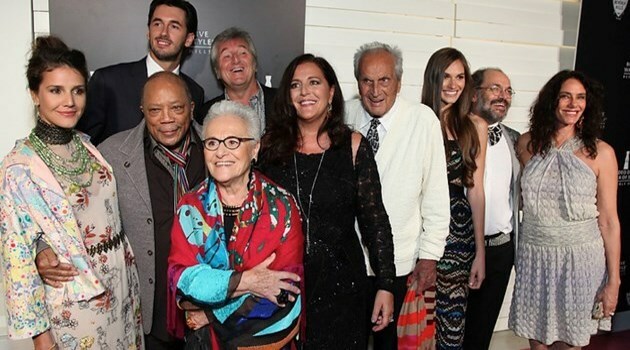 Today, the company’s founders, Rosito Missoni, 73, and husband Ottavio, 83, who is better known as Tai, are still very active in the firm. 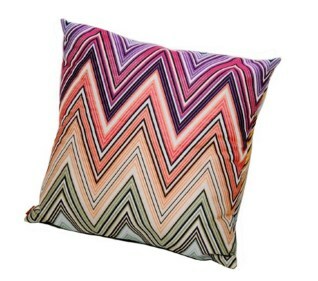 Rosita heads up the Missoni Home Collection, while her husband is the textile expert. In 1997, the couple ceded the direction of the ready-to- wear firm to their three children. Vittorio, 50, is in charge of marketing, Luca, 48, is product manager and Angela, 46, is the creative director. When the Missonis married in 1953, they soon combined business forces and within the year were producing a small knitwear collection in the basement of their Gallarate home. Shortly afterwards, La Rinascente department store in Milan bought their collection. The following years were filled with experimentation for the enterprising couple, and saw them “reinterpreting” the workings of the Raschel knitting machine to produce a series of lightweight, patterned knits of rayon, a fabric which even I today is a mainstay of their collections. Ш Soon to follow were their bold chevron stripe knits in audacious color combinations, which were quickly noticed by international buyers, especially in America. Among the buyers was Marvin Traub, president of Bloomingdale’s. He became one of Missoni’s biggest fans and the following year inaugurated ‘ the first in-store Missoni boutique in the U.S.
From that point on, Missoni rapidly gained a following in America. Accolades from the fashion press began to pour Ini “The Missonis ore the new status symbol of Italian design,” wrote Bernardino Morris of The New York Times, while Women ‘§ Wear Dally Included Missoni among the top 20 “fashion powers” of the world. The Missonis’ burgeoning status In the fashion firmament was further enhanced In 1973 when they received the prestigious Nelman Marcus Fashion Award, the International prize considered by many equivalent to an Oscar, A year later, they walked off with the American Printed Fabric Council’s Tommy Award for their Innovative print designs. The shift from museum walls to the stage took place In 1983 when the couple was asked to create more than 100 costumes for the La Scala Opera’s production of Lucia dl Lammermoor starring Luciano Pavarotti. And In 1992, dancer and choreographer, David Parsons, commissioned the Missonis to design the costumes for his Step Into My Dreams ballet which has become part of the New York Ballet Company’s repertoire. As the years progressed, the Missonis enlarged their creative output to Include numerous licensing arrangements. Today, these Include a line of hosiery, handbags, eye wear, shoes and two secondary lines, M Missoni and Sport Missoni. In 2003, the parent company, Mlssoni S.p.a. manufactured 250 garments of which two-thirds were women’s knits and the remainder menswear. Annual volume for both sectors totaled 53 million euros. 120 department stores and a freestanding Missoni boutique owned by the parent company, located at 10C? Madison Avenue in New York City. Currently ringing up sales in their New York boutique and elsewhere is the Spring/Summer collection, surely one of the most colorful in recent years. For in the hands of Angela Missoni, talented daughter and creative director, the line has taken on a newly youthful, high-spirited look. “For this collection, I was inspired by the 1950s, a decade when glamorous, ultra-feminine clothes were all the rage,” says Angela. Though it might sound cliched, she offers something for every woman, regardless of age or taste. In a jubilant mix of stripes, florals, swirls and leopard prints, all done in neon brights and sophisticated neutrals, Missoni shows sinuous dresses with daring decollates, one-of-a-kind twin sets and bathing ensembles to be worn only at the beach. Many of their knits are also punctuated by shimmery metallic yarns, “to create more pizzazz, more fun,” she says, adding that in a season partial to embellishment, metallics work equally well for daytime knits when used in moderation. Staunch believers in the total look, the Missonis have always encouraged stores to sell their signature accessories alongside their knits. Currently, these include jeweled star pins that can be fastened at the waist or worn in the hair, sleek handbags of straw edged in python, strappy sandals with precipitous wedge heels and over-sized sunglasses similar to those made famous by fashion icon, Jacqueline Kennedy Onsasis. Many themes aired in Missoni’s women’s collection can also be found in the menswear line. The bold chevron, umbrae and awning stripes are present, as are the airy mesh textures and iridescent surfaces, although the latter are usually relegated to small items such as scarves or evening shirts. Where the two collections mainly differ is in the handling of color; the hot pinks, oranges, turquoises and golds of the women’s collection are tempered to colors like terra cotta, beige, grass green, and traditional black and white for the men’s knits. However, you could never call this collection “dull.” These are definitely knits for the man who wants to “stand out from the crowd”, says Luca Missoni, who also has a hand in designing. Indeed, the Missonis see their customers for their vividly patterned, high-tech knits as an active, forward-thinking, self-assured breed. 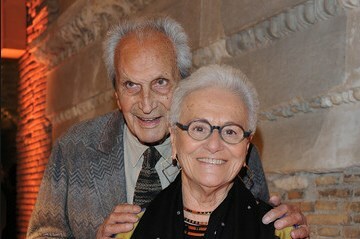 “They are men and women who like to dress freely, who aren’t afraid to experiment,” says Rosita Missoni.